For the larger local government district, see Guildford (borough). Guildford i/ˈɡɪlfərd/ is a large town in Surrey, England, located 27 miles (43 km) southwest of central London on the A3 trunk road midway between the capital and Portsmouth. It is the seat of the borough of Guildford. The root of the first part may be the word "gold" rather than Guild, a society or meeting of tradesmen: the only known 10th-century (Saxon) record uses Guldeford and in the 11th century Geldeford[n 2]; both meaning gold and ford. Local historians with an interest in toponyms cite the lack of gold in the region's sedimentary rocks and have suggested that the mention of "gold" may refer to golden flowers found by the ford itself, or the golden sand; several older sources such as Lewis's topological dictionary of 1848 prefer and give an unreferenced assertion there was a guild. There is an old coaching inn on the Epsom Road previously called the "Sanford Arms", which may derive from "Sand Ford", adding weight to the suggestion that the first part of "Guildford" and its many historic predecessors may refer to the very distinctive golden sand showing on the banks of the River Wey where it cuts through the sandy outcrop just south of the town. In Sir Thomas Malory's 1485 fictional series Le Morte d'Arthur, Guildford is identified with Astolat of Arthurian renown; however only rural Celtic Bronze Age pieces have been found in the town. Continuing the Arthurian connection, there is a local public house, the Astolat. Some of the tiles built into Guildford Castle may be Roman, and a Roman villa has been found on Broad Street Common at the end of Roman Farm Road just west of Guildford's Park Barn neighbourhood. Alfred the Great, the first Anglo-Saxon king of unified England, named the town in his will. Guildford was the location of the Royal Mint from 978 until part-way through the reign of William the Conqueror. In 1995, a chamber was discovered in the High Street, which is considered to be the remains of the 12th century Guildford Synagogue. While this remains a matter of contention, it is likely to be the oldest remaining synagogue in Western Europe. In 1598, a court case referred to a sport called kreckett being played at the Royal Grammar School, Guildford. 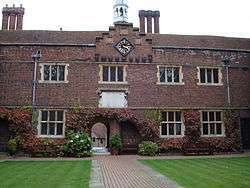 The school was built in 1509 and became Royal gaining the patronage of Edward VI in 1552. The Oxford English Dictionary gives this as the first recorded instance of cricket in the English language. The Chilworth gunpowder works operated right through the Industrial Revolution, and transported much of its wares through Guildford and its toll paid canal network. During World War II, the Borough Council built 18 communal air raid shelters. One of these shelters, known as the Foxenden Quarry deep shelter, was built into the side of a disused chalk quarry. Taking a year to build, it comprised two main tunnels with interconnecting tunnels for the sleeping bunks. It could accommodate 1000 people and provided sanitation and first aid facilities. Having been sealed since decommissioning in 1944, it has survived fairly intact. The quarry itself is now the site of the York Road car park, but the shelter is preserved and opened once a year to the public. 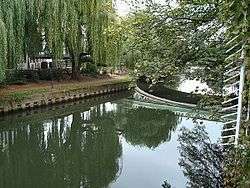 Except in winter, The National Trust run short and longer trips on the Wey Navigation, starting from Dapdune Wharf in the town centre, where there is a visitor centre. An arched Gothic restored medieval storage Undercroft in the High Street is open twice a week. Receiving many grants and local support, the relatively small Guildford Castle has a roof viewing platform, 2003-4 added floor, a model of the fullest original castle[n 5], and interpretation panels. Guildford has an Olympic size Lido May-to-September, dating from the 1930s, that is open for public swimming or hired corporate entertainment. Guildford is sometimes described as the county town of Surrey, but it is not clear whether this is the case or not. The issue is not made easier because sources disagree over the definition of a county town. 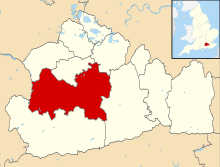 Most sources state that the county town is the administrative centre for the county, but local government undergoes frequent reorganisation and what was once the county town may no longer be the administrative centre. 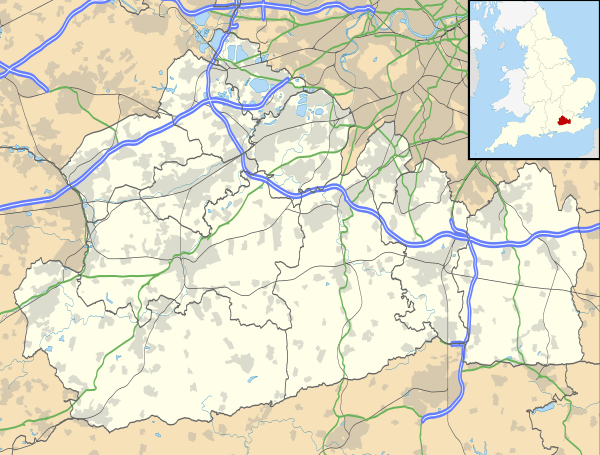 Surrey County Council has no administrative presence in Guildford but is located at Kingston upon Thames, which became part of Greater London in the 1960s, though the above cite claims Guildford as the county town. 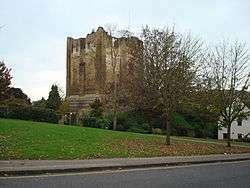 Guildford's previous official historian claims that Guildford was granted the "ancient county court in Guildford by a grant of Henry III in 1257, marking Guildford’s status as county town of Surrey", but it has been argued that this status is an inaccurate interperatation by said historian. His position is not backed up by the original documentation. Like the rest of Surrey and the British Isles, Guildford has a maritime climate with cool summers and mild winters. The nearest Met Office weather station for which records are available is at Wisley, about 6.5 miles (10 km) to the north-east of Guildford. Extremes of temperature recorded in the area range from 37.8 °C (100.0 °F) during August 2003 down to −15.1 °C (4.8 °F) during January 1982. The Wisley weather station held the UK July record high of 36.5 °C (97.7 °F)(2006) between 2006 and 2015. The lowest temperature reported in recent years was −12.6 °C (9.3 °F) during December 2010. 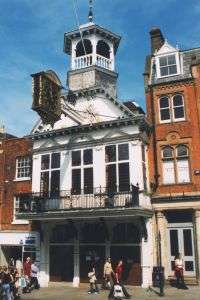 Guildford has an art gallery, Guildford House Gallery, in the High Street, in a 17th-century Grade I listed town house which is run by Guildford Borough Council. Its art collection includes works of Guildford and the surrounding area, and works by Guildford artists, most notably John Russell R.A. Also run by the Borough Council is Guildford Museum housing archaeology, local history and needlework displays. Smaller private fine art galleries are also present on the High Street. Stoke Park, Guildford's largest park, was the venue for the now defunct Guilfest music festival during the summer but still hosts the Surrey County Show – agricultural and general – on the last bank holiday Monday in May. Prior to 2007, the Ambient Picnic was held in Shalford Park, by the River Wey. There are three Roman Catholic churches to St Joseph, St Marys, and St Pius X in Merrow. St Augustine's Abbey at Chilworth on the outskirts of Guildford is a Grade II listed building designed by Frederick Walters and constructed in 1892. It is one of four Benedictine monasteries in Great Britain having been a Franciscan Friary of the Order of Friars Minor until 2011. 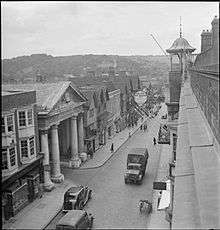 Guildford has had a synagogue as early as the 12th century. Guildford's Spectrum Leisure Centre is a national prizewinning sports centre that includes a variety of pools (for leisure and for serious swimming), Ten-pin bowling, a Laser tag area, an ice rink and an athletics track, as well as general halls used for indoor sports including gymnastics and trampolining. The Spectrum is home to several local sports teams, including Guildford City Football Club of the Combined Counties Football League, and the Guildford Flames of the English Premier Ice Hockey League. Guildford International Volleyball Club have managed to win the top of the fourth division of the National Volleyball League. As for the rest of Surrey, Guildford's state schools operate a two/three age groups system. Primary schools in the town include Holy Trinity (which merged with Pewley Down in 1995), Burpham, St Thomas of Canterbury (Catholic), Boxgrove Primary School and Goldford Grove. Amongst the Junior schools are Bushy Hill, Northmead Junior and Queen Eleanor's C of E. Secondary schools include George Abbot, Guildford County School, St Peter's, King's College and Christ's College. The best-known school in Guildford itself is the Royal Grammar School. The 'old school' building, which was constructed over the turn of the Tudor and Elizabethan periods and houses a chained library, lies towards the top of High Street. The school was established in 1509. Nearby is the prep school Lanesborough School which is the choir school for Guildford Cathedral and has had a long association with the Royal Grammar School. Other independent schools include Guildford High School, Tormead School and Rydes Hill Preparatory School. Though often referred to as a city Guildford is a town, but has applied for city status several times. Guildford's 2002 application to be granted the status of a city was unsuccessful, losing out to Preston, the only English town that was formally recognised as a city as part of the Queen's Golden Jubilee celebrations. Traditionally, the establishment of a diocesan cathedral in a town conferred city status. Guildford is a significant economic hub in Surrey, a county with no cities. Although Guildford was historically the county town for Surrey, the council itself has its administrative base in Kingston upon Thames which, although formerly in Surrey, is now in Greater London. Public sector organisations of note that have headquarters in Guildford include Surrey Police, the South East England Development Agency and the Government Office for the South East. Politically, the constituency of Guildford is thought of as a traditional Conservative seat. However, for the first time in over ninety years, the 2001 general election returned a Liberal Democrat Member of Parliament, Sue Doughty. The 2003 Borough Elections returned a majority council for the Conservative party, replacing the Liberal Democrat-controlled council. In the 2005 general election Guildford returned a Conservative Party MP, Anne Milton – by a narrow margin (0.7% of the voting electorate, or 347 votes) and despite a 0.5% rise in the Liberal Democrat vote. The Conservatives also held the council majority in the local elections of 2007. Guildford is a thriving commercial town with the 2011 Financial Times annual list of Top 500 Global Companies listing five major businesses with a significant presence in the town – the list includes Philips Electronics, Ericsson, Colgate-Palmolive, Allianz and Sanofi. Media Molecule (acquired by Sony Computer Entertainment in 2010), Lionhead Studios (acquired by Microsoft Game Studios in 2006, closure announced on March 7 2016), Hello Games, Criterion Games (acquired by Electronic Arts on 2004), Ghost Games UK (founded in 2013 by Electronic Arts), and Bullfrog Productions (acquired by Electronic Arts in 1995, closed in 2001) have helped the town become a centre for video game production. 1930 hailed the end of the Poor Laws and Guildford Union Workhouse, next to Cooper Road (named after Samuel Cooper (surgeon)) was renamed Warren Road Hospital playing a vital role in the World War II war effort it received victims of the London air raids and specifically Dunkirk and D-Day victims. The Spike, a vagrants and casuals ward, continued as an overnight shelter for the homeless until 1963. Due to be demolished in 2003 and replaced by a new Community Centre the Spike Casual Ward was surprisingly, bestowed with Grade II listing and has been converted into a community and Heritage Centre open to the public. The Spike retains the only stone breaking cells that can be viewed by the public in the country. 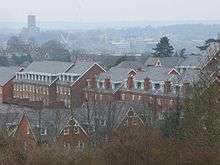 These small residential neighbourhoods are immediately south of and generally below Cathedral Hill also known as Stag Hill. Both neighbourhoods are close to Guildford Train station to the southeast and become without division Onslow Village to the south. 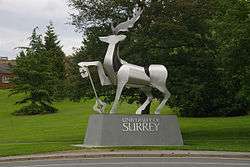 As the University occupies the top and north of Stag Hill, many residents here study at the University of Surrey. Onslow Village is the sloped suburb on the western outskirts of Guildford. It with one outlying road continuation, forms a wedge between the A3 road and A31 roads south of the junction of the A3 and Egerton Road, Guildford's Cathedral Turn and directly below Henley Fort, an 1880s built London Defence Position and a Scheduled Monument. The area consists of a number of residential streets many of which are characterised by beech hedges. Parts of Onslow Village have been designated as conservation areas, enforcing a number of planning restrictions that are intended to protect the character and identity of the locality. It has the 5th Guildford Scout Group a community news website, a Tennis Club and Onslow Arboretum. It has a small village centre, with a parade of shops and a village hall. Onslow has one infant school, Onslow Infant School, as well as Queen Eleanor's School, a primary school. Onslow also has its own church, All Saints. Onslow Village also has its own football team called Onslow FC established in 1986. The Village also has a Residents' association, the Onslow Village Residents' Association (OVRA) which was set up in 1956 and whose object is to "safeguard the amenities of Onslow village and to promote the welfare, interests and well-being of the residents". Onslow Village Society formed with the aim to tackle the acute shortage of decent working class housing following the First World War. Onslow Village Ltd acquired 646 acres (261 hectares) or just over a square mile of land from Richard Onslow, 5th Earl of Onslow in 1920 for approximately one quarter of its market value at the time. The aim was to create a "Garden City" to be modelled on the ideas of Ebenezer Howard's Garden City Movement. It was their intention to build a self-contained community with smallholdings, public buildings, open spaces, recreation grounds, woodland and a railway station, as well as developing sites for churches, hotels and factories. On Saturday 1 May 1920, ten weeks after the formation of the Society, the foundations of the first two houses were laid and by March 1922 ninety-one houses had been built. Unfortunately due to a lack of funding the scheme never reached full completion, with about 600 houses actually being built. Original drawings however showed that there were further plans to develop the farmland at Manor Farm, north of the A3. By the mid-1970s, one third of the properties were still owned by Onslow Village Ltd. Then, in 1984, the company was wound up and many shareholders and tenants had the chance to buy their homes at extremely affordable prices. Park Barn Estate is home to King's College, a school for 11- to 18-year-olds. There are also a number of primary schools in the area of Park Barn, including Guildford Grove School, which has a specialist sign-supported rescue base on the site that supports pupils with profound hearing impairments. Football team Park Barn FC recently started up, playing in League 4 of the Guildford and Woking Alliance League. Guildford City Boxing Club moved from Bellfields to Park Barn in 2014, and is situated on Cabell Road. The central northern area of the town contains Stoke Park and the historic manor of Stoke at its centre, now the site of Guildford College. Within Stoke is the Guildford Spectrum leisure and sports centre. To the south of this mostly residential neighbourhood is London Road railway station, On Stoke Road here there is a listed hotel, The Stoke. Located adjacent to the Park Barn Estate, the Westborough Estate was built in the 1920s due to the growing population at the start of the 20th century. Westborough is home to the United Reformed Church and to a Community Primary School located on Southway. The town has two railway stations. The main station is on the west side of the River Wey, across the river from the main shopping area and the bus station. It is on the Portsmouth Direct Line between London Waterloo and Portsmouth Harbour. There are also direct lines to Aldershot; Reading; Gatwick Airport via Dorking and Redhill; and alternative London routes via Cobham and Stoke D'Abernon and Epsom. There is currently one daily long-distance service to Newcastle upon Tyne, via Reading, Oxford, Birmingham, Derby, Sheffield, Doncaster and York. Guildford's other station, London Road, is about half a mile (1 km) north-east of the town centre, on the New Guildford Line. It is served by stopping services only between Guildford and Waterloo: there are four trains an hour each way (two on Sunday), two via Cobham, and two Waterloo services via Epsom. These services are operated by South West Trains. A few peak hour trains from both stations, operated by Southern, go to London Bridge via Sutton and to Victoria via Selhurst. Guildford lies at the eastern end of the A31 and is bypassed by the A3, which links London and Portsmouth. The M25 is to the north-east of the town. Bus services in Guildford are primarily operated by Arriva, with some additional services by Buses Excetera [sic], Safeguard and Stagecoach. Most routes are centred on the bus station, next to the Friary shopping centre. Many local bus services are circular routes (starting and ending at the bus station) with different numbers for the clockwise and anticlockwise services. There are also buses to many surrounding towns and villages such as Woking and Aldershot. There is also a park and ride service, with three main sites at Artington, Merrow and the Spectrum. A fourth park and ride site, close to the Surrey Sports Park, was opened in late 2013. National Express operate coach service 030 between London Victoria Coach Station and Portsmouth and Southsea via Park Barn in Guildford, but not stopping in the town centre. The biggest Guildford train operator co-run their Guildford (main) station's self-service folding Brompton Bicycle hire scheme. Guildford has been the home of several notable writers. Edward Carpenter, the socialist poet and homosexuality equality activist, moved to the town after the First World War and lived there until his death in 1929 and is buried in the same hillside cemetery. Other authors from the town include Gerald Seymour, writer of Harry's Game and New York Times film critic Mordaunt Hall. Author and charactacurist P. G. Wodehouse was born prematurely in Guildford in 1881 while his mother was visiting the town. Novelist Kazuo Ishiguro was a resident. The Stranglers were based in the town in the early 1970s and were briefly known as "The Guildford Stranglers". Drummer Jet Black ran an off-licence in the town and bass player Jean Jacques Burnel attended the Royal Grammar School. Progressive rock musicians Mike Rutherford, of Genesis and Andrew Latimer of the band Camel, were born in Guildford, as was jazz saxophonist Iain Ballamy. In the early 21st century music, drum and bass producers Cause 4 Concern and Sub Focus are from the town. Singer and actress Yvonne Arnaud lived in Guildford for many years, and the Yvonne Arnaud Theatre was named in her honour; later the town was the home of comic director, writer and actor Mackenzie Taylor (1978–2010). Actors Stuart Wilson, Christopher Gaze and Bonnie Langford are from the town, and Monty Python member Terry Jones attended the Royal Grammar School. Guildford has been home to driver Katherine Legge and sprinter Allan Wells, gold medallist in the 100 metres at the 1980 Olympics. Footballer Matt Jarvis grew up in Guildford, and the town is also home to Olympic kayakers Rachel Cawthorn and Liam Heath. Cartoonist Piers Baker (made Ollie and Quentin); the model Jodie Kidd, who was born in the town; Holly Samos – radio researcher and presenter lives here. Many of mathematician, logician and cryptographer, Alan Turing's earliest years were in this town where his family lived; Michael Buerk, BBC newsreader; Roger Fry, the English artist, critic and member of the Bloomsbury Group lived in the house (Durbins) he designed and built in the town from 1909 to 1919;. Alfred Smith, recipient of the Victoria Cross, was born in Guildford, as was WWE wrestler Paul Burchill. Guildford has been captured on film in Carry on Sergeant, which was filmed at the former Queens Barracks, and The Omen, a scene from which was filmed at Guildford Cathedral. Singer-songwriter Robyn Hitchcock has sung about the town in "No, I Don't Remember Guildford", a song from his 1999 album "Jewels for Sophia". 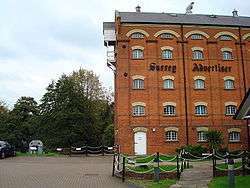 The University Hall on the campus of the University of Surrey was the site of the first ever Led Zeppelin gig on 25 October 1968. In The Hitchhiker's Guide to the Galaxy by Douglas Adams, the character Ford Prefect, actually an alien from Betelgeuse, claims to be an out-of-work actor from Guildford. ↑ This eastern section of the Harrow Way is also known as the Pilgrims' Way, and in deeds, Via regia, and in the Pipe Roll 4 Ric. I m. 8 d of 1192–3 as Strata regia de Geldedone this being the west hill, Guildown whereas the east hill, where Guildford Castle is, was Pewsey Down. ↑ Geldefort, Geldesfort, Gildeforda, Gildeforde (12th century); Geldeford, Guldeford (13th and 14th centuries); Gylford and Guldeford (15th and 16th centuries); Guildeford, Gildford, Gilford, and Gillford (16th and 18th centuries). ↑ Olausson, Lena; Sangster, Catherine (2006). Oxford BBC guide to pronunciation. Oxford, England: Oxford University Press. p. 160. ↑ "Saxon Guildford". guildford.gov.uk. Archived from the original on 24 February 2008. Retrieved 28 March 2008. 1 2 3 4 5 6 7 8 9 H.E. Malden (editor) (1911). "The borough of Guildford: Introduction and castle". A History of the County of Surrey: Volume 3. Institute of Historical Research. Retrieved 29 October 2012. 1 2 "Guildford Borough Council : History of Guildford Castle". Retrieved 24 December 2011. ↑ "The Good Move Guide : Guildford History". Retrieved 24 December 2011. ↑ "A Brief History of Guildford". Retrieved 24 December 2011. 1 2 3 4 Samuel Lewis (editor) (1848). "Groton – Gunnerton". A Topographical Dictionary of England. Institute of Historical Research. Retrieved 29 October 2012. ↑ "Travel and Tourism Gossip : Guildford". Archived from the original on 11 January 2012. Retrieved 24 December 2011. ↑ "beerintheevening.com Website: Astolat, Pub". Retrieved 15 February 2007. ↑ Domesday Book entry of 1086. ↑ "Guildford Borough Council Website: Castle". ↑ Sharman Kadish, Jewish Architectural Heritage in England, English Heritage, 2006, p. 69. 1 2 "History of Guildford Jews". Guildford Jewish Community. Archived from the original on 29 September 2007. Retrieved 24 December 2008. ↑ "Parliamentary Constituencies in the unreformed House". Retrieved 24 December 2011. ↑ "Guildford Borough Council : The Wool Trade". Retrieved 24 December 2011. ↑ "History of Cricket". Retrieved 24 December 2011. ↑ Birley, Derek (1999). A Social History of English Cricket. Aurum Press Ltd. p. 5. ISBN 1-85410-941-3. ↑ Chilworth Gunpowder Works Surrey (Archaeological investigation report series), Wayne D Cocroft, 2003, English Heritage, London. ↑ Gavin Morgan (1992). The Guildford Guy Riots. Northside Books. ISBN 978-0-9520205-0-9. ↑ "icons.org.uk The Guildford Guy Riots". ↑ "History & Business". Wincanton Plc. Retrieved 26 April 2008. 1 2 "The Foxenden Quarry Air Raid Shelter". In and around Guildford. Retrieved 17 May 2008. ↑ "Foxenden Quarry Shelter, Guildford". Subterranean Exploration. Retrieved 17 May 2008. ↑ "BBC News: 19 October 1989". 19 October 1989. Retrieved 12 February 2007. ↑ Shopping in Guildford Archived 19 April 2015 at the Wayback Machine. ↑ "Guildford Borough Council Website-Tourist Information Centre". Archived from the original on 11 January 2007. Retrieved 13 February 2007. ↑ "A History of The Angel Posting House". Retrieved 13 February 2007. ↑ "Channel 4 "The Best and the Worst Places to Live In Britain"". Retrieved 8 February 2007. ↑ "Guildford – Best and Worst Places to Live – Channel 4". Retrieved 6 November 2007. ↑ "PRNewswire: Top of the Shops – Gerald Eve Publishes Prime Retail". 5 November 2004. Retrieved 16 April 2007. ↑ "Gerald Eve Prime Retail Flyer". Retrieved 16 April 2007. ↑ http://gwydir.demon.co.uk/jo/maps/uktowns.htm "They were the administrative centre for local government, the market town, and the largest town in the county. However, local government has been reorganised more than once, and today the county towns are not necessarily the adminstrative (sic) centre of the county"
↑ https://play.google.com/store/books/details?id=sbcuAAAAIAAJ&rdid=book-sbcuAAAAIAAJ&rdot=1A Collection of Statutes Connected with the General Administration of the Law: Arranged According to the Order of Subjects, with Notes, Volume 8 page 344 "The Names of Towns limited for the safe Custody of Weights and Measures according to the King's Standard for the Shires following, as particularly appeareth ... Surr. The Town of Guilford"
↑ "Medieval Guildford—"Henry III confirmed Guildford's status as the county town of Surrey in 1257"". Guildford Borough Council. Archived from the original on 1 November 2013. Retrieved 30 October 2013. ↑ "Der Spiegel (German): Der 8 Megapixel-Filmpalast". Retrieved 12 June 2007. ↑ "New £19.5m civic centre approved". BBC News. 14 July 2006. Retrieved 20 August 2008. ↑ "Your New Venue". G Live. 20 May 2011. Retrieved 20 May 2011. ↑ "Never a dull moment with Estelle, article in Get Surrey". ↑ "Guildford Philharmonic loses council funding". BBC News. 9 November 2012. ↑ James Watkins. "Farewell concert for Guildford Philharmonic Orchestra". ↑ "COG Press Release 6 February 2007 "Ambient Picnic moves to Epsom"". Retrieved 13 February 2007. ↑ "Ambient Picnic Official Website". Retrieved 13 February 2007. ↑ "Astolat Model Railway Club Website". Retrieved 7 June 2014. ↑ Church of Holy Trinity Historic England. "Details from listed building database (1029258)". National Heritage List for England. ↑ St Mary Historic England. "Details from listed building database (1377918)". National Heritage List for England. ↑ St John the Evangelist Historic England. "Details from listed building database (1294008)". National Heritage List for England. ↑ St Nicholas Historic England. "Details from listed building database (1029291)". National Heritage List for England. ↑ "Latest News From The Monks of St. Augustine's". St Augustine's Abbey. 2010-12-23. Retrieved 2016-04-06. ↑ "Welcome to Chilworth Benedictine Monastery". St Augustine's Abbey. 2016-03-01. Retrieved 2016-04-06. ↑ http://www.friar.org/former-locations/chilworth/chilworth-news.html "The Minister Provincial, Fr Michael Copps, in his monthly letter dated 9 March 2011 related to the Brothers of the Province the quiet ending of Franciscan life at what had been since 1890 the heart of our Province as its Novitiate House until recent years." ↑ "Derby City Council Bulletin 4 July 2005 "highest score of 87% which was given to Guildford Spectrum"". Retrieved 13 February 2007. ↑ "National Pool Safety Awards". Archived from the original on 29 September 2007. Retrieved 13 February 2007. ↑ "Guildford Spectrum Website- Swimming". Retrieved 13 February 2007. ↑ "Guildford Spectrum Website- Tenpin Bowling". Retrieved 13 February 2007. ↑ "Guildford Spectrum Website- Children's Parties". Retrieved 13 February 2007. ↑ "Guildford Spectrum Website- Ice Skating". Retrieved 13 February 2007. ↑ "Guildford Flames Official Website". Retrieved 13 February 2007. ↑ Hodges, Lucy (12 June 2008). "Which is the best university for sport?". The Independent. London. Retrieved 27 February 2009. ↑ "Guildford Hockey Club". Retrieved 16 March 2013. ↑ "Surrey Spartans Hockey Club". Retrieved 16 April 2013. ↑ "Guildford City boxing coach Edwards gets GB call". Retrieved 26 January 2016. ↑ "Guildford City Boxing Club History". Retrieved 26 January 2016. ↑ "A Brief History 1960's". The College of Law. Retrieved 20 March 2008. ↑ "Surrey County Council Website: County Hall". Retrieved 12 February 2007. ↑ "BBC News- Election 2007– Local Council Elections- Guildford Council". 4 May 2007. Retrieved 4 May 2007. ↑ "About the Surrey Research Park". Retrieved 24 December 2011. ↑ Henley Fort Historic England. "Details from listed building database (1019286)". National Heritage List for England. ↑ "Streetmap.co.uk Map of the area". Retrieved 17 March 2007. ↑ Gillard D., (1999) King's Manor School: an experiment in privatisation? ↑ The Reading Chronicle story on cattle market. ↑ The Stoke Hotel Historic England. "Details from listed building database (1029231)". National Heritage List for England. ↑ "Surrey Country Council – Guildford town park and ride". Archived from the original on 3 August 2008. Retrieved 29 September 2008. ↑ "Fourth park and ride service for Guildford". Retrieved 3 December 2013. ↑ "London – Portsmouth/Southsea – National Express 030" (PDF). Surrey County Council. 5 March 2007. Retrieved 12 January 2009. ↑ "Gerald Seymour at Books at Transworld". Retrieved 6 March 2007. ↑ "Today in Literature-P.G.Wodehouse". Retrieved 7 March 2007. ↑ Patterson, CHristina (4 March 2005). "Kazuo Ishiguro: The samurai of suburbia". The Independent. London. Retrieved 27 March 2011. ↑ "Stranglers website: History". Retrieved 15 February 2007. ↑ 4ortherecord.net. 4ortherecord.net. Retrieved on 17 July 2013. Archived 23 July 2011 at the Wayback Machine. ↑ "CollectorsPost Website: Yvonne Arnaud Biography". Retrieved 15 February 2007. ↑ "Comic Mackenzie Taylor takes his life". Chortle. 20 November 2010. Retrieved 10 November 2010. ↑ "Internet Movie Database- Stuart Wilson". Retrieved 15 February 2007. ↑ "Daily Record". 11 February 2006. Retrieved 15 February 2007. ↑ "Royal Grammar School website- Terry Jones". Archived from the original on 13 October 2006. Retrieved 15 February 2007. ↑ ChampCar driver: "Motoring.co.za: Woman driver set to test for Minardi". Retrieved 7 March 2007. ↑ Philip, Robert (19 January 2004). "Wells driven on by anger". The Telegraph. Retrieved 12 July 2016. ↑ Fifield, Dominic (21 March 2011). "Matt Jarvis's work ethic draws praise from all quarters". The Guardian. Retrieved 12 July 2016. ↑ "Liam Heath". British Canoeing. Retrieved 12 July 2016. 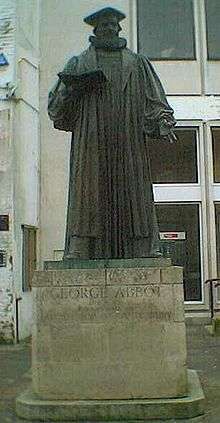 ↑ "Famous Mathematicians of Guildford". Retrieved 6 March 2007. ↑ "BBC Correspondents". BBC News. 3 January 2003. Retrieved 3 June 2007. ↑ "Ledzepplin.com : Concert Timeline". Retrieved 24 December 2011. ↑ "Guildford and Alice in Wonderland". ↑ "Guildford Borough Council Meeting Minutes 7 October 2004 "As part of the 25th anniversary of the twinning with Freiburg, the Mayor had recently hosted a very successful visit by a delegation from Freiburg."" (PDF). Archived from the original (PDF) on 28 June 2007. Retrieved 12 February 2007. 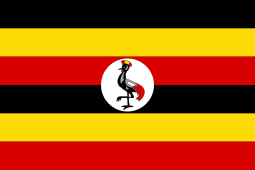 ↑ "Guildford-Mukono Link Website". Retrieved 12 February 2007.